I started collecting parts almost immediately. eBay and Craigslist are great resources for a budget minded builder, and I found a low mileage set of CBR1000RR forks, calipers, trees, etc, for a good price, and then a set of Ducati Marchesini 999S wheels and thin Brembo rotors. Before I could swap out the running gear, I wanted to design my own headlight. This is the "face" of the bike, and it's one of the most important visual aspects to a machine. Nothing "off-the-shelf" would work for me. I began experimenting with building a carbon fiber bucket, using plastic take out containers from a favorite Thai restaurant and a margarine tub as bases to take molds from. While I was imagining what I wanted to create, I started to see the final product, and I knew it would be a simple aesthetic of carbon and aluminum. CARBON IS THE NEW BLACK. I fit the wheel in the forks and cut up some spacers on a lathe to center the Ducati wheel on the Honda axle. Fortunately, the axle diameter was the same size, so I didn't need to change the wheel bearings or the inner spacer in the rim. The rotors were a bit inboard of the Tokico calipers, so I machined some rotor plates to bring each rotor out by 2mm. I really like that these rotors are so thin, the reduction in mass is a boon for a guy like me (who's wheelie abilities are not that great). These forks are also lighter than the ones I would be removing. Everything was aligned perfectly, and I was anxious to see this front end transplanted. The triple trees reduced the offset by a few mm, and would quicken steering considerably. This is actually at the Mythbusters shop garage near Caesar Chavez/Army in SF. A friend wanted to see how I would put everything together, and in exchange I was able to use some very large machines. I knew I wanted a projector beam headlight, so I purchased a 999 headlight and also found another projector (from an automobile). The 999 headlight was absurdly long, and I didn't want anything hanging that far from the neck on my naked bike. I suppose with some carbon work I could have built a tiny mini-fairing, ala first gen Katana, that would have looked alright, but I wanted this bike to be as minimalist as possible. I decided to proceed with the lower light. It was already equipped with an LED Halo ring, which I wanted to incorporate into my design. Why should only late model cars get all the cool lighting effects? I took the stock exhaust canister (which weighs more than a comparable sized fire extinguisher), and chopped it up. I liked the single bead of weld around the end cap, and thought that would make a unique headlight housing . . . and also keep parts within the project. Ultimately, I settled on using aluminum for the headlight shell, and for a quick mock-up, I welded a steel ring together with flanges. Later, the steel was replaced with an aluminum center ring, lathed to fit and lighter. I am extremely pleased with how it turned out. 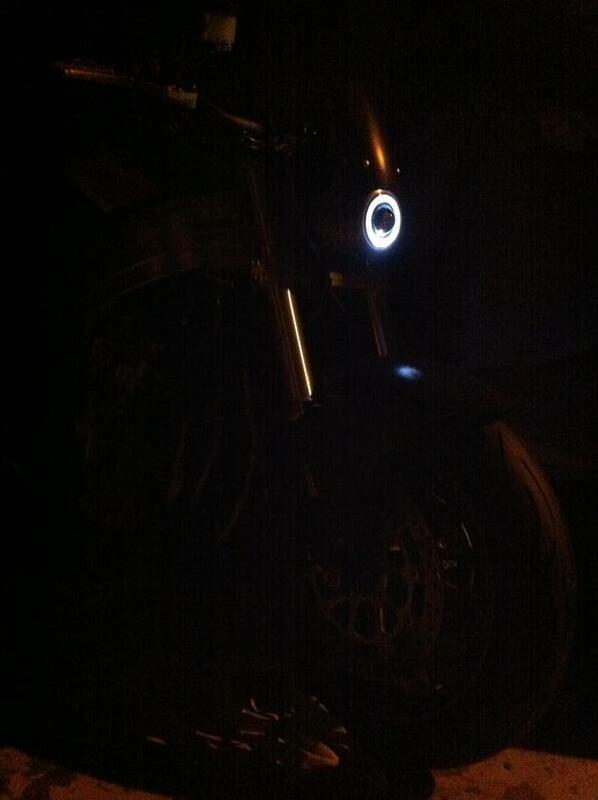 Along with the Halo, I mated an HID kit to the projector, and the ballast for the headlight resides under the fuel tank. The light is bright white, and it took me a while to get used to when driving at night. But, it is powerful, more powerful than many bike's high beams (but focused, so no blinding of oncoming traffic). I modified the steering stops on the triple trees to get back some of the steering radius I lost with the low offset of the '07 front end. It's a bit "buellish" now, but perfectly fine for the street or track. Once the headlight design was actualized, some stainless steel tube was bent and welded, and the mounting points to the triple trees are hidden. The silver anodized fork tubes are completely free of clamps/brackets. I machined the top triple tree (on the underside) so I could properly position the original 900RR fork lock, and also to create clearance for the headlight. I recessed the bucket as far back as possible, milling the lower edge of the rear bucket to clear the frame tabs that mount the fairing stay. It is a very simple matter to disconnect the headlight harness, remove two bolts, and have a completely bare front end. I'm thinking at some point I will adapt a carbon fiber fairing of some sort for trackdays, and this quick detach ability will come in handy. Not to mention, it's cool and I'm happy I didn't modify the frame. This was another goal of mine, albeit a low priority one. I used a Trailtech Vapor gauge because they're designed by Americans living outside of Portland, OR, and it is a small and simple to install unit. 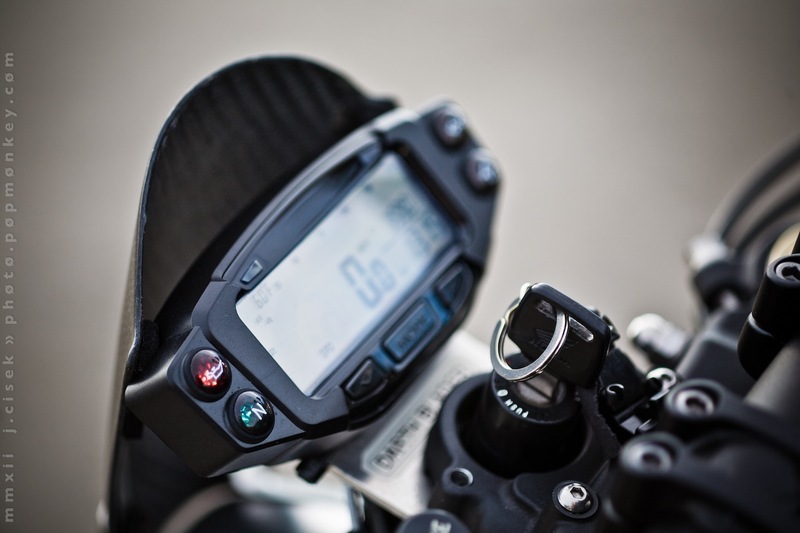 It tracks overall mileage, trip mileage (and run time), speed, temperature (engine and ambient), and has programmable shift lights for the LCD bar tach. I really like it, and when installed nicely it blends in well and is very functional at night, thanks to the backlit LCD screen. I am fairly impressed with the device, particularly for the price, but I do have some concern for the gauge of wire used. It's quite small, and as an added safety measure against the elements (I ride, rain or shine), I built a small carbon fiber fly screen to keep the storms and debris from causing any damage. Another nice feature of the Trailtech gauge is that there is an optional plastic "dash" that can be added which houses 4 additional "idiot" lights. I wired up my headlight, oil pressure light, neutral, and turn-signals to these (because it's a streetbike). All the wiring for the gauge, ignition, and '07 switch boxes, is neatly routed back under the fuel tank. 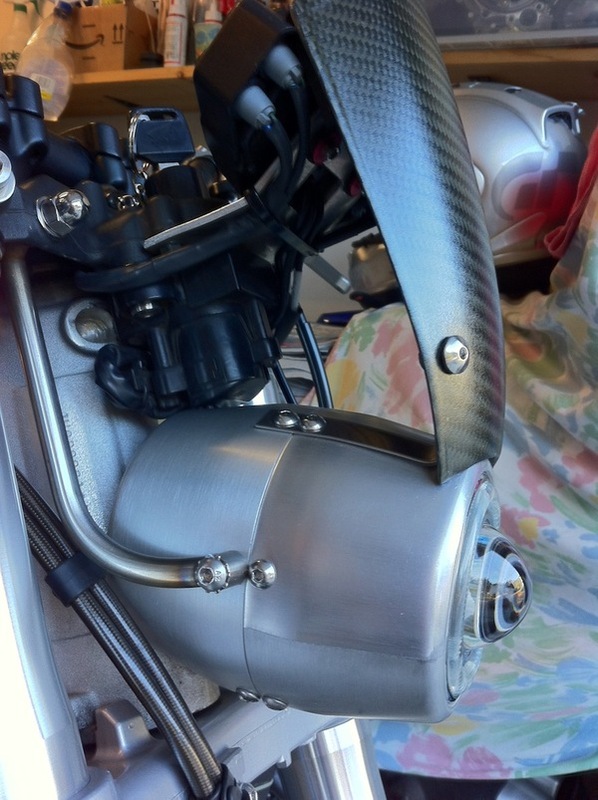 I was surprised to find that the '07 CBR1K throttle cables fit perfectly to my 900RR carbs, and the newer control boxes were slimmer and much nicer than my old ones. As you can surmise, very big handlebars are mounted, but that's for a later post. I've got wheelies to do.